Over the last few months, I’ve been interviewing local dance companies or organizations that have each taken their own forms of dance and either made them distinctly their own (as Filipinos are always good at doing) or have developed them to be competitive enough with the rest of the world. There’s a long and drawn out predicament that most of these groups (none of the them being “culturally” Filipino dances in the traditional sense of the word) have faced: finding support, recognition, and even a regular audience that can truly appreciate their creative level and globally competitive skills. Douglas Nierras’ Powerdance is one of those jazz companies that have been around for the longest time. Douglas himself has been hailed the dance guru on local television, and he’s known for his temperamental outbursts on local American Idol ripoffs. Douglas’ group recently performed Black Theater Dance, a variation of the Black Light Theater popularized in the Czech republic. The basic principle of the performance is the use of black lights, which basically, when turned on in total darkness, enhances bright colors and significant lessens the visibility of black colors. What makes Powerdance’s performance so extraordinary is the extent to which they employed black light techniques: while most existing performance of black theater use black lights sparingly throughout the performance, often in between regular dances or theater performances, Powerdance used it all throughout the performance, basically playing on the possibilities of what can be seen and what can’t be seen. Ballet Philippines, on the other hand, is one of the three major ballet companies in the countries and the only one that has focused on Modern Ballet. The company’s founder, Alice Reyes, was known from early on to have been a major influence on Modern Ballet in the Philippines, with her fusion of native influences (either cultural settings and references or native dances) with traditional ballet. Today, the company performs fusions of everything from jazz, samba to hip hop with ballet. It’s a trend that has been long popular in Europe and the United States (“You should see modern dance companies in New York,” says Bam. “It’s no holds barred. They do everything there.”). The company’s main concern has been the dying patronage of ballet in general, and the difficulty of pleasing older audiences (purists and traditionalists who are used to tutus and Swan Lake only) while reaching out to younger ones (who haven’t seen BP’s modern ballet performances and still think ballet is only tutus and Swan Lake). It’s a dangerous balancing act they are constantly striving to perfect, risking alienating either their existing patrons or their possible newer, younger audiences. The third dance group I interviewed recently is the Philippine National Hiphop Team/s, led by Head Coach (and arguably local “Father of Streetdance”) Jungee Marcelo. Consisting of three individual groups (the recent Italian Open Champion, All Stars, the elite group The Crew and the UP Streetdance team), they started competing in the World Hiphop Championships a year or two ago, and some of their teams have made top places in different competitions as well. What has been most interesting about this particular dance story is the very history of hip hop dance in the Philippines. We call it by a name that is definitely associated with the local hip hop scene (and is not a term used anywhere else in the way we use it)–Streetdance (regardless of what this Wikipedia entry says). Streetdance was a term given by Jungee when he first came back to the country after learning his moves on the streets of LA. 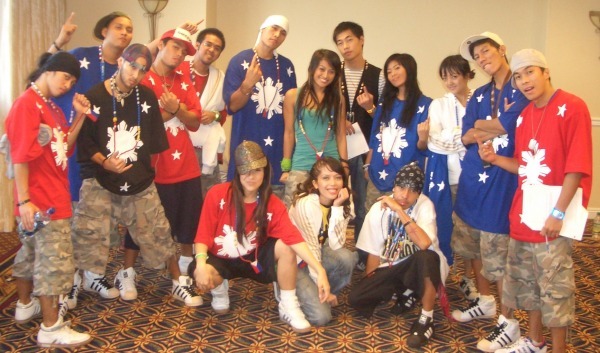 There are certain distinct differences between hip hop dance and streetdance, especially when it comes to meaning (since hip hop has strong cultural undercurrents in the African-American community while streetdance is rooted in entertainment from back in the ’80s) and style (Pinoys dance with a certain grace and incorporate expansive and lateral movements not found in hip hop). Popular dance in the Philippines has come a long way, but it seems that audiences are the ones who have a lot of catching up to do. Hopefully, more support will come and people will realize the richness around them. In the meantime, here’s wishing them the best. Ballet Philippines photos by Oscar W. Profos. The Crew and UP Streetdance photos by Ali Vicoy. All articles originally published in the i section of the Manila Bulletin.